It’s hard to get excited about most in-flight meals, but on a long flight, you need to eat. Today, TPG Editor-in-Chief Zach Honig digs into some of United’s latest dishes, fresh from the airline’s Newark catering facility. I spent yesterday afternoon stuffing my face at Newark Airport. And while that probably isn’t anyone’s first choice of dining venue, I genuinely had a good meal(s). The reason? 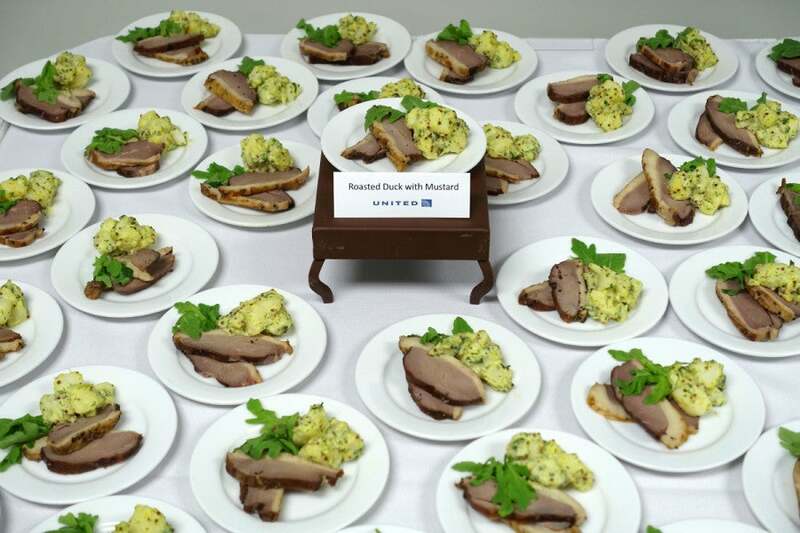 United’s rolling out dozens of new menu items, and the airline invited some top frequent flyers and a few journalists to try out a few of the new and improved entrees. American, Delta and smaller carriers like JetBlue update their menus often, too, but with a new CEO and a high-profile partnership, this United refresh seemed especially notable. 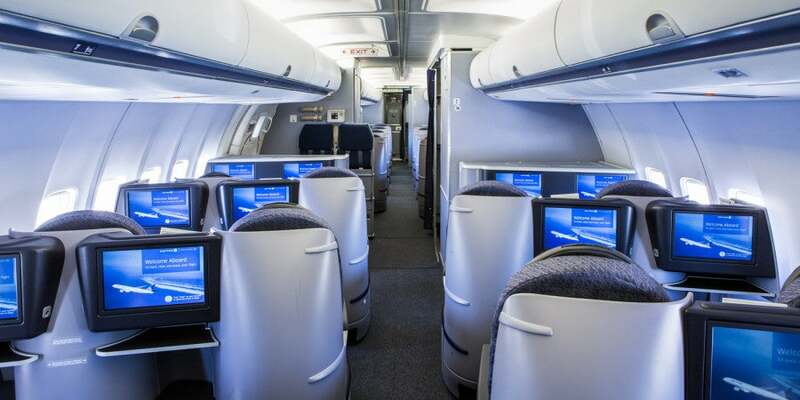 The most notable improvements will be seen in United’s BusinessFirst cabin on domestic flights — entirely new entrees and starters will launch on October 25, the same day that United’s p.s. operation will move from JFK to Newark. 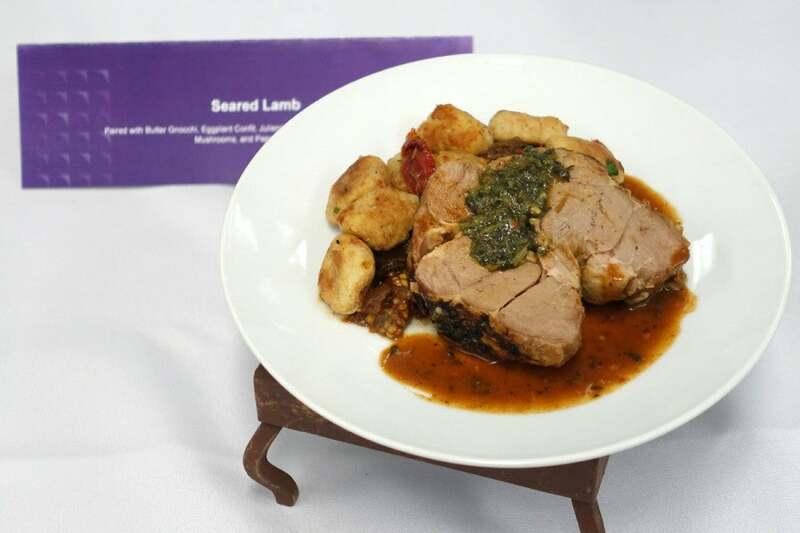 Then, on November 1, the airline will roll out an updated menu on other domestic and regional first and business-class flights. Additionally, flights longer than three hours departing between 1:30 and 3:59pm will offer entree salads rather than snack baskets (finally! 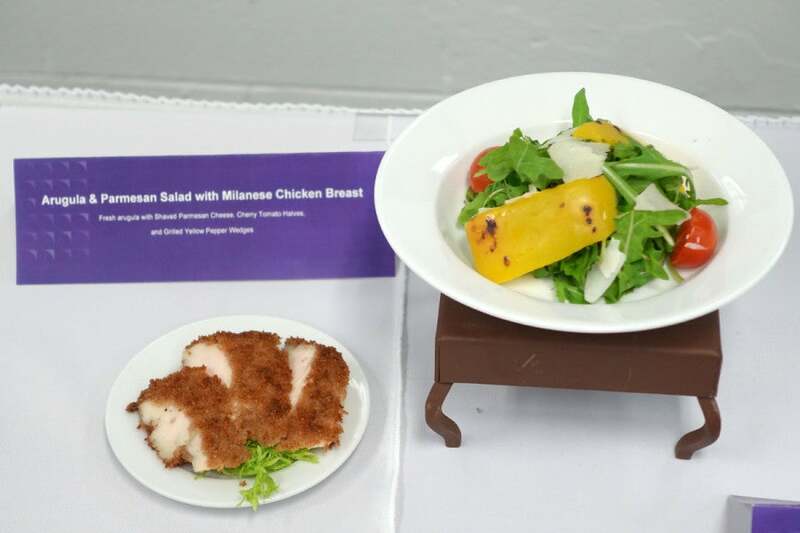 ), and meals will be served on late-night flights from Hawaii. There are also some modest improvements to the economy buy-on-board menu. 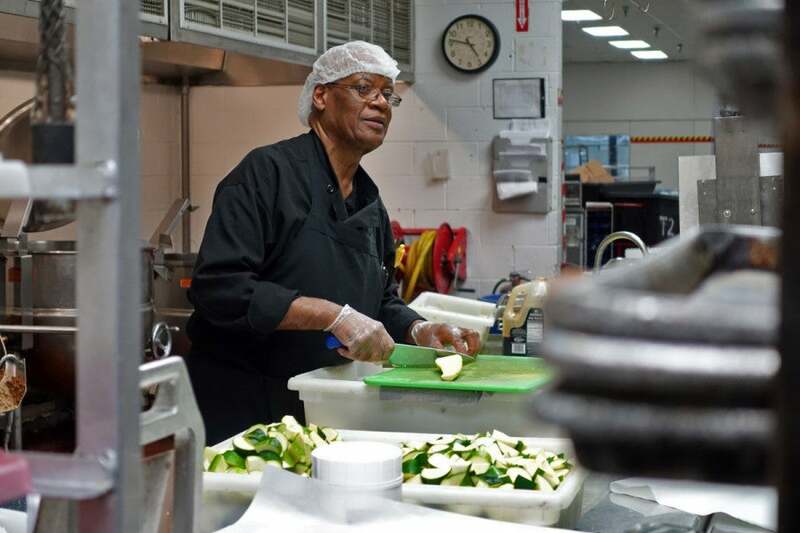 Earlier this year, the airline announced a new partnership with The Trotter Project, a Chicago-based non-profit that works with top chefs from around the world. I chatted with New York City chef Christian Ramos, owner of Virginia’s in NYC’s Alphabet City. Ramos was one of the chefs who worked closely with United on its new menu, and while it’s not entirely clear which improvements can be attributed to the partnership, there’s definitely a bit more creativity at play here. 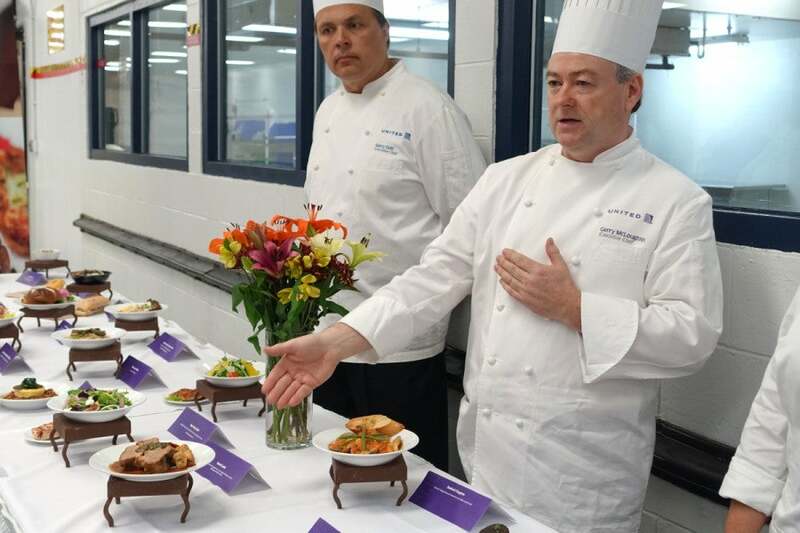 United Executive Chef Gerry McLoughlin presents the airline’s fall menu items. United’s top chefs from around the country came out for the Newark event. 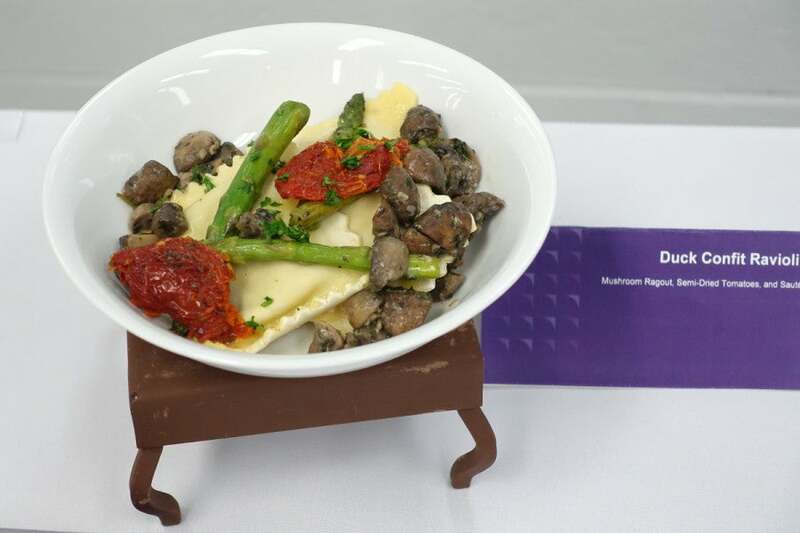 Most of the menu items are developed near the airline’s Chicago headquarters, in a facility that even has mock galleys with working equipment for several aircraft types. Seared lamb with gnocchi and eggplant. One brand new item is seared lamb with butter gnocchi and eggplant. The meat itself tasted pretty good, but the fried gnocchi were a bit dried out, even on the ground. Amazon cod with bok choy and noodles. 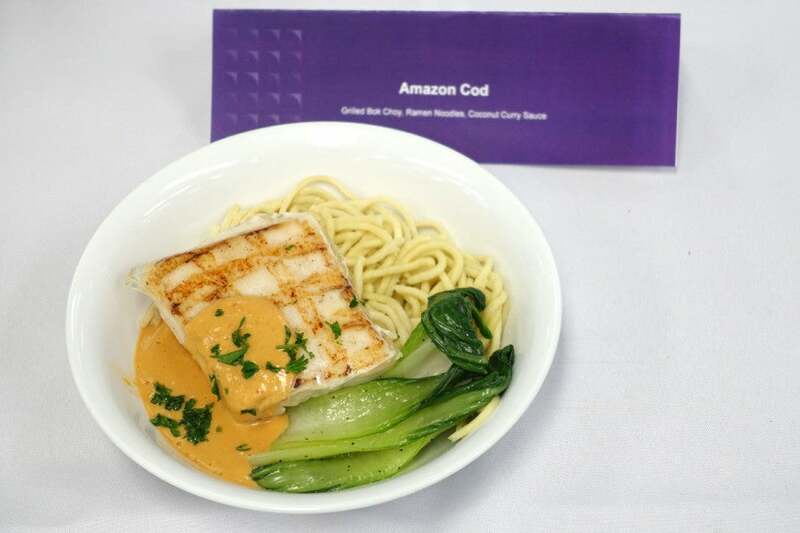 The Amazon cod was definitely the best fish dish I’ve ever had from United. I’m sure it won’t taste quite as good in the air, but it was moist and flavorful in Newark. 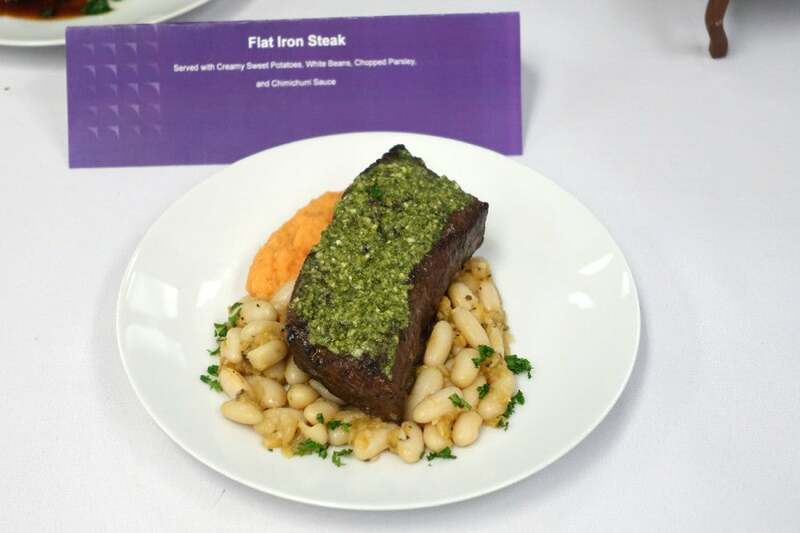 United’s new flat iron steak. The flat iron steak also had a lot of flavor. It’s not quite restaurant-quality, though it’s more than passable for an airline meal. The beans and sweet potato mash were also good. United’s replacing its cheese ravioli with a duck confit version. It tasted heartier, for sure, but it’s not vegetarian-friendly. Lentil chili with polenta cake. 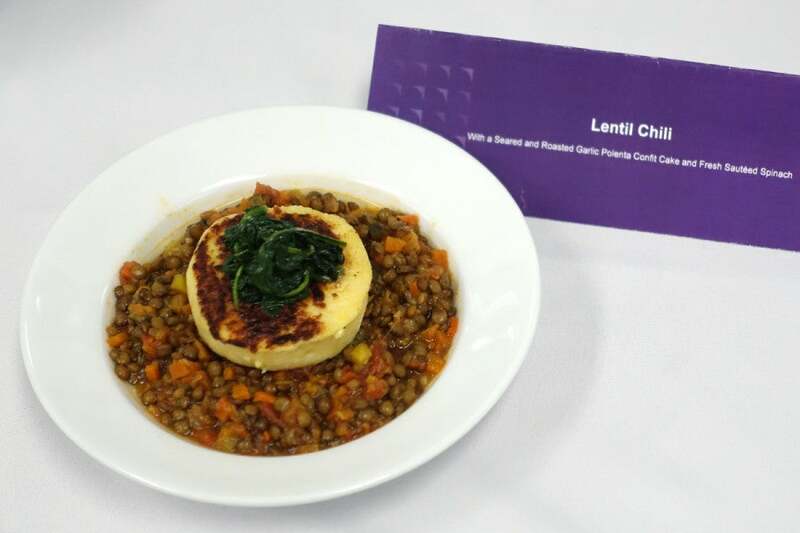 To replace the now meat-stuffed pasta, United’s offering a lentil chili with polenta cake. I didn’t get to try this one, but it looked nice on the plate. Mushroom risotto with grilled asparagus. 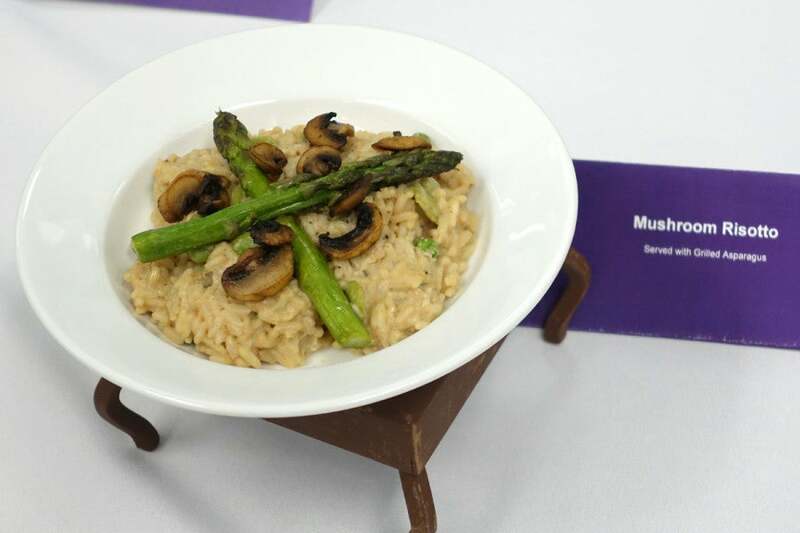 There’s also a vegetarian mushroom risotto with grilled asparagus. It was pretty good. Seafood cioppino with fish, scallops and shrimp. 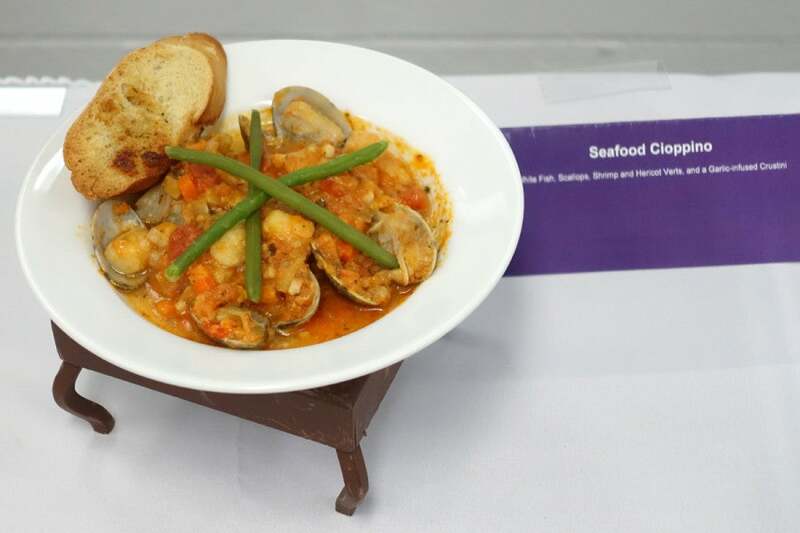 The seafood cioppino is a lighter alternative to the meat options above. I didn’t get to try it, but it looks similar to the cioppino United’s served in the past, with the addition of green beans and garlic bread. Bleu cheeseburger on a pretzel roll. United’s considered removing the cheeseburger in the past, but customers apparently love it, so it’s here to stay. 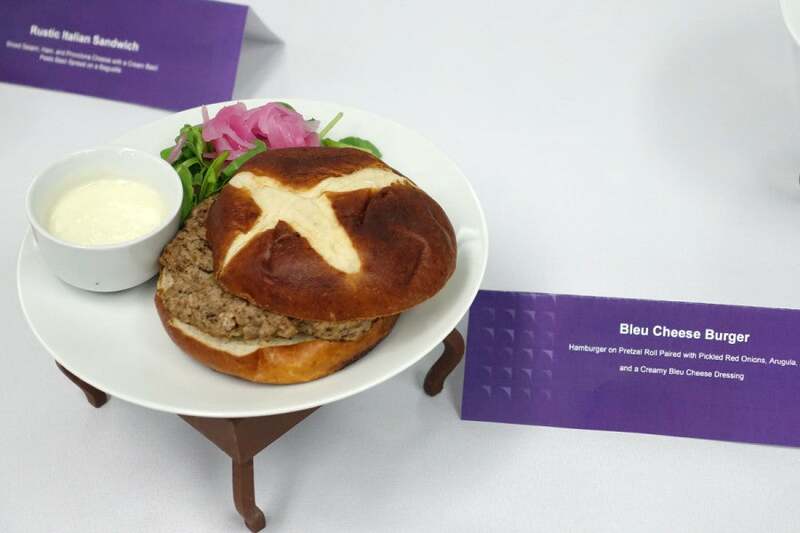 The latest version is served on a pretzel roll with blue cheese dressing. Arugula and parmesan salad with fried chicken on the side. United has a few entree salads, which will be served on shorter flights. Each has a protein that’s served on a separate plate, making all of the salads vegetarian-friendly as well. Roasted duck with mustard appetizer. There are a few new BusinessFirst appetizers as well, including the roasted duck with mustard above. I was too full to sample anything else at this point, unfortunately. United recently added Moscow mules. 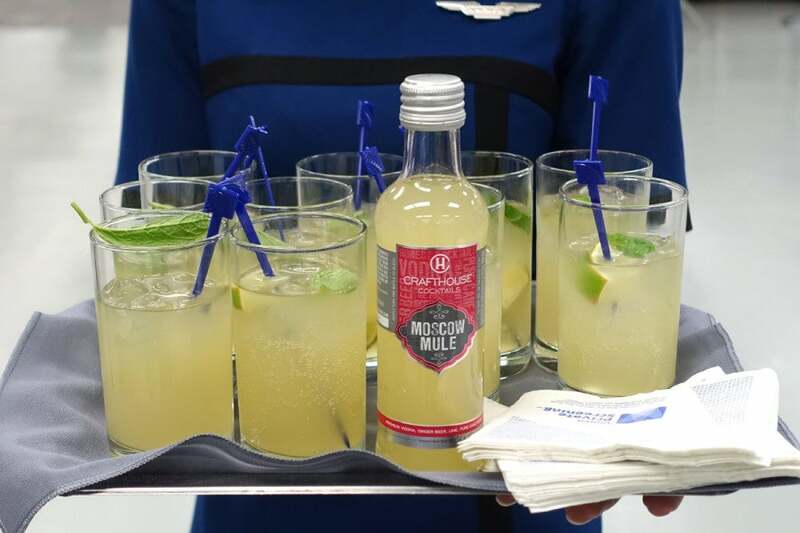 The airline just started serving bottled Moscow mules last week. They’re very sweet, and taste quite a bit like the Mai Tais United stocks on flights to Hawaii. 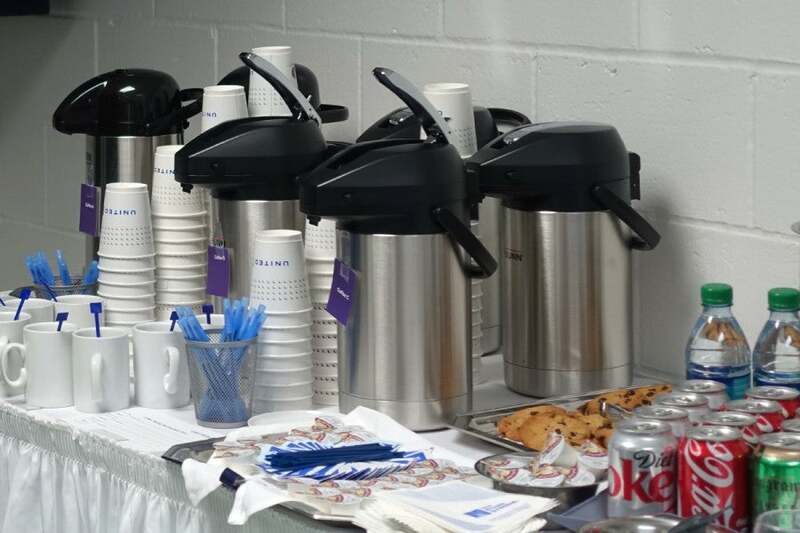 And this will certainly be welcome news for some: United is currently in the process of replacing its onboard coffee. We tried a few different options, including the coffee United currently serves (it was a blind test, but I’m pretty sure it was option “C,” which I liked least of all). After the taste test, I got to tour the catering facility. The hot kitchen (above) is surprisingly small considering that the airline produces some 30,000 meals every day. 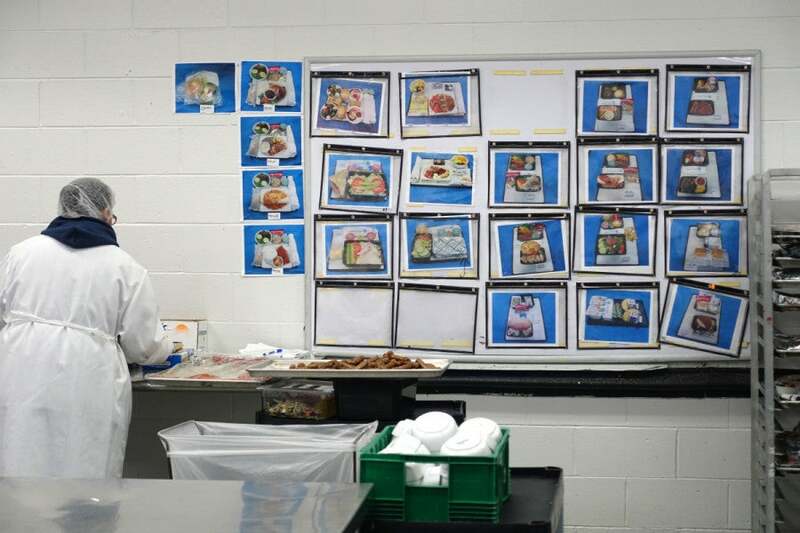 Employees arrange trays based on these presentation photos. For many entrees, items are plated before they’re loaded onto carts. Workers can reference these presentation photos to ensure that they’re positioning items consistently. Wrapping domestic first breakfast entrees. Here’s a new(ish) breakfast entree: quiche with sausage and tomato. 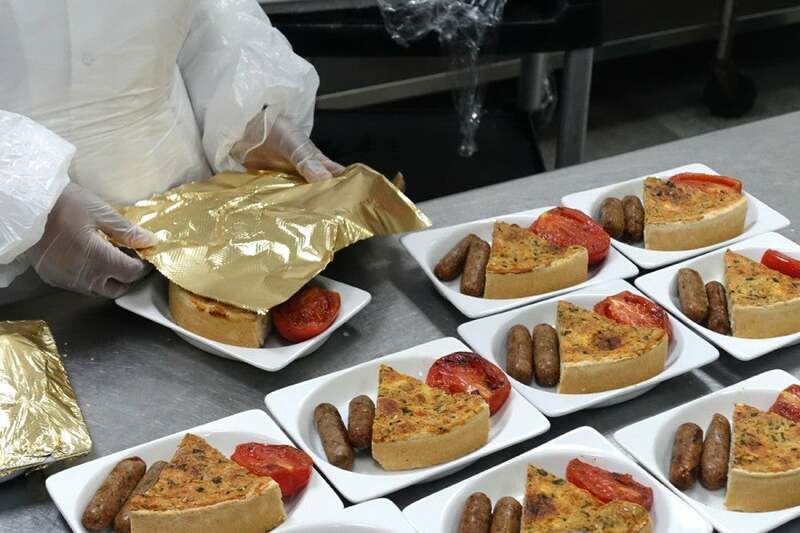 Once the meals are plated, employees cover hot items in a metal foil so they can be heated easily in the galley. United’s Newark catering facility also loads economy snack boxes. 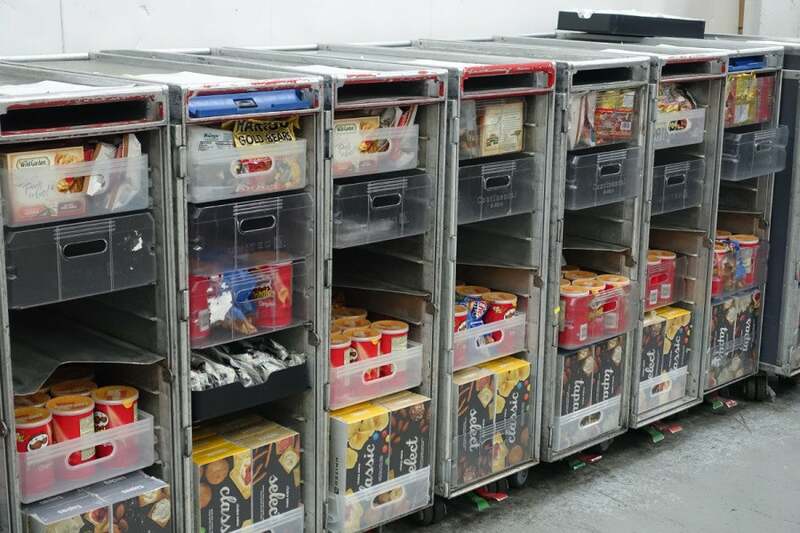 Everything related to catering is handled at this Newark facility, including economy snacks and even duty free items. The (sort of) good stuff! 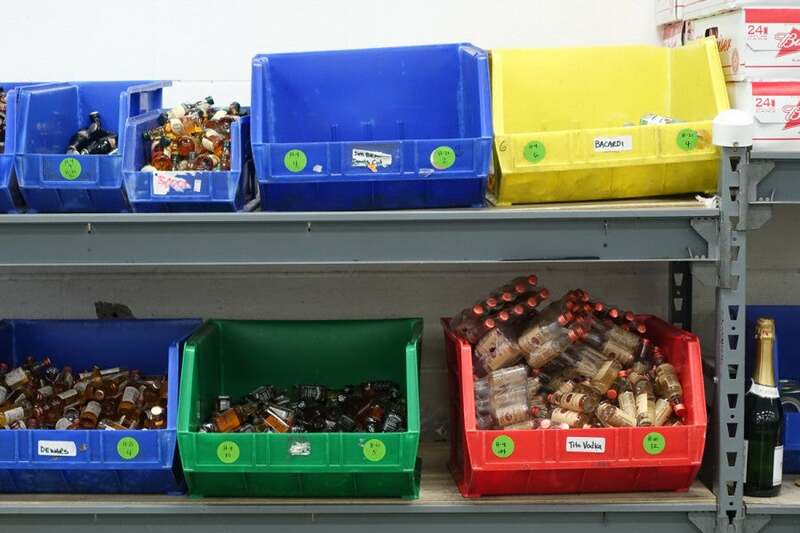 Alcohol is closely monitored — only certain employees can access the beverage section to load drink carts. 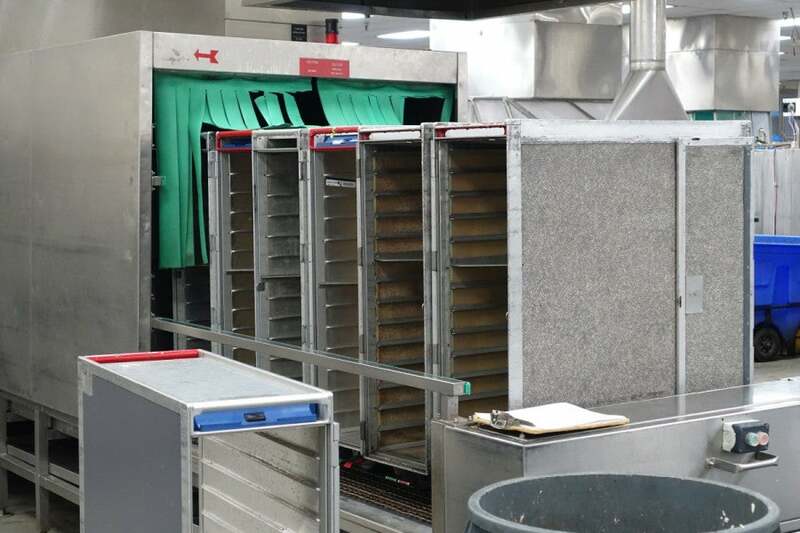 Did you know United washes its food carts every time they come in? There were a few surprises, including this machine for washing food carts. Every time carts come back into the facility, they’re washed alongside all other serving materials. 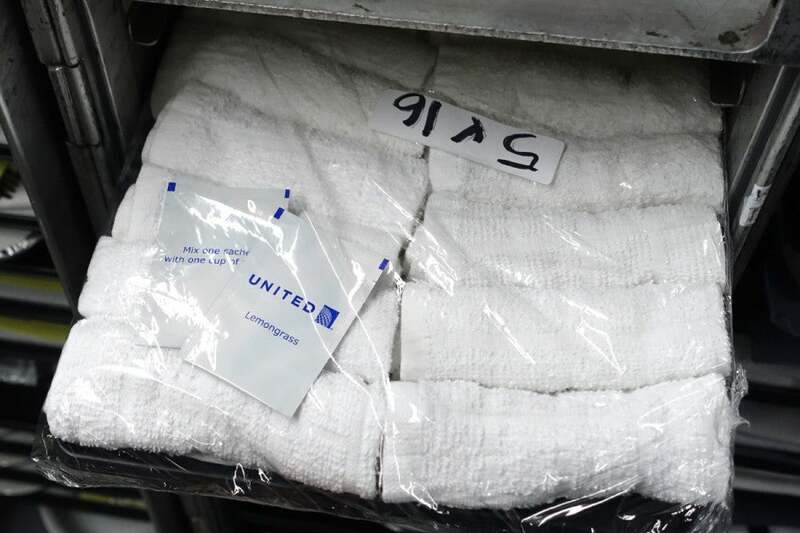 Apparently United’s hot towels have a lemongrass scent? While there’s no question that changes are afoot at United, these menu tweaks were planned long before Smisek got the boot. Still, there are definitely some improvements here, and based on yesterday’s taste test, I feel almost confident enough to strike #4 from the list of 10 Changes We’d Like to See From United’s New CEO. The real test will come in-flight, however — as good (or decent, in some cases) as the airline’s new entrees tasted just feet away from the kitchen, there’s no guarantee that we’ll have the same experience at 30,000 feet.